H.E Prof. Ibrahim Adam El Dukhiri, the Director General of the Arab Organization for Agricultural Development (AOAD), received in his office on Monday morning, the 19th of February 2018, H.E Mr. Saeed Hussein Eid, the Somali Minister of Agriculture. 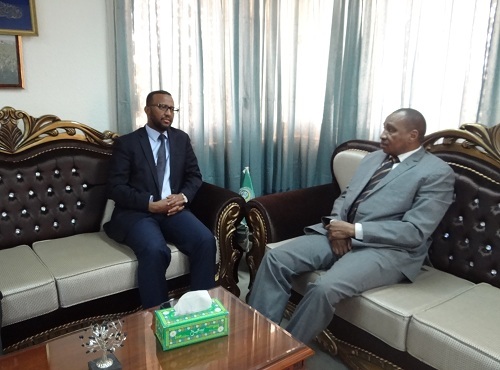 During their meeting, H.E Mr. Saeed referred to the natural resources of Somalia as the main economic resource. He focused on the livestock as Somalia's first economic resource. He praised the efforts of the AOAD and its support to the agricultural, livestock and fisheries sectors. H.E Prof El Dukhiri stressed the keenness of the AOAD to play its role in Somalia to achieve the desired benefit in the natural resources, including fish and agriculture. The AOAD will exert its efforts in increasing the number of trainees of Somali cadres in all fields related to its work in order to develop the capacities according to the needs of Somalia. The visit came in the context of H.E Prof. El Dukhiri's efforts to provide the necessary support to the member countries. Moreover, his keenness to unite the efforts to achieve the food security and the sustainable agricultural development in the Arab countries and especially Somalia.